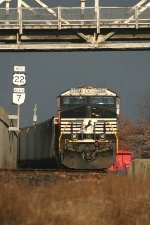 Description: NS 26Q swings through the curve east of Newport, PA. Description: 19G westbound past the Phillipsburg RailRoad Historians site who was holding an Open House. 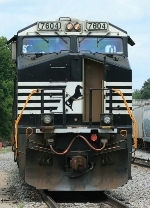 Description: a NS loaded steel train heads towards the east. Description: 212 heads east at 9:42AM. Description: NS ES40DC 7604 and SD70 2573 lead an eastbound cofc train through Cresson. Description: South end of the fueling racks in Bluefield WV. Description: The fueling racks in Bluefield. Description: Fueling racks and coaling tower in Bluefield. Description: Pushers roll over Wolf Creek enroute to a mine on the Wolf Creek Branch. Description: NS 22A leaving the yard at Bristol after meeting 23G.